What Hi-Fi? Awards 2014 - all the winners revealed! | What Hi-Fi? What Hi-Fi? Awards 2014 - all the winners revealed! The What Hi-Fi? Awards are official. 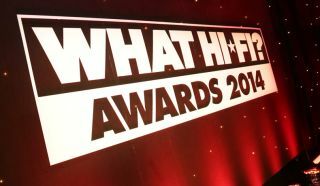 Last night's ceremony saw us reveal 99 winners in 24 product categories, highlighting the best products you can buy across hi-fi, home cinema, portable audio, streaming and more. Sony was the big winner, winning a total of nine Awards across multiple categories including Product of the Year in the home cinema amplifiers category and the best in-ear headphones Award. Samsung also featured heavily in the winners taking away three Awards for its 48in, 55in and 65in televisions, including the first What Hi-Fi? Awards for 4K TVs. Bluesound scooped the inaugural Product of the Year in the multi-room systems category, while Naim took top honours in the hugely competitive wireless speakers section. In more traditional territory, the B&W 685 S2 speakers took home our stereo speaker Product of the Year Award, while Q Acoustics and Wharfedale, amongst others, also took home 2014 Awards in the speakers section. Spotify was confirmed as our favourite streaming service, while Sky+HD is once again, in our opinion, the best subscription service, taking the Product of the Year in the set-top boxes category. The iPhone 6 and Sony Xperia Z3 were the smartphone winners, while Apple and Google shared the Best Buys for tablets. If you didn't follow it all live on the What Hi-Fi? Twitter account then you can search Twitter using the #WhatHiFiAwards hashtag to see some behind-the-scenes pictures from the Awards ceremony. If you'd rather see the full glory in our special Awards issue of the magazine, then it's in shops from today or you can buy a copy online right now.